Jerusalem - Israel’s president says he’s been meeting with the Palestinian leader - a rarity with peace talks frozen - and believes he wants peace. Shimon Peres says he has met with Palestinian President Mahmoud Abbas and other officials several times in recent months. There was no immediate comment from Palestinian officials. Palestinians refuse to resume talks unless Israel stops building on territory they claim for a future state. Israel says negotiations should proceed without preconditions. Talks have been stalled for about three years. Peres won the 1994 Nobel Peace Prize with Israel’s premier, Yitzhak Rabin, and Palestinian leader Yasser Arafat for previous peace efforts. 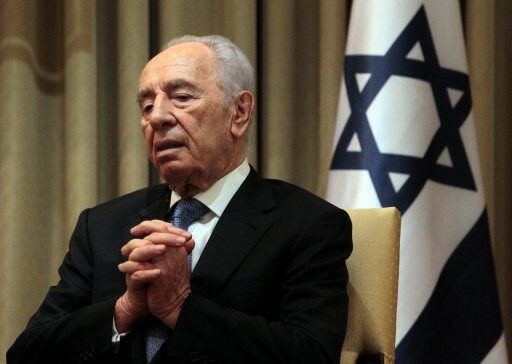 MR. Peres, you're a ceremonial president not the prime minister. You do your job, let him do his. Don't mix in where you don't belong. One utterly failed Oslo, thanks to you, is more than enough, absolutely no other one needed. Why is this visit any different then when netura karte went and visit them? The neture karte went for peace and so did he. Why didn't the neture karte deserve the same respect like him? The answer to your question is very simple: Shimon Peres is the president of a sovereign country of nearly eight million people. Neturei Karta represent nobody but themselves. The difference is that peres wants to live on the Israeli side of the border and netura karte wants to live on the palistinian side. he at it again the last time he started his oslow process hundreds of jews were murdered by hamas and arafat plo Peres ... give it up and retire already.. time for you to start putting on tefelin and keep mizvos..
Sovereign? LOL. The state referred to is but a satrapy of the declining United States, whose president is birds of a feather with this unelected misleader, and he probably used the elter kocker to do his bidding.